Are you wondering how to find the best dehumidifier? Do you even need to purchase a dehumidifier? If you do, what features should you be watching for in each product review? How much is it going to cost you to get a durable dehumidifier for your home that will meet all of your needs? We know you’ve got questions about dehumidifiers. This guide will help you find the answers you want. Whether you are looking for the best dehumidifier reviews, you are comparison shopping, or you’re not sure if you even need to buy this appliance, we’ll help you find symptoms, find solutions, and save money today. 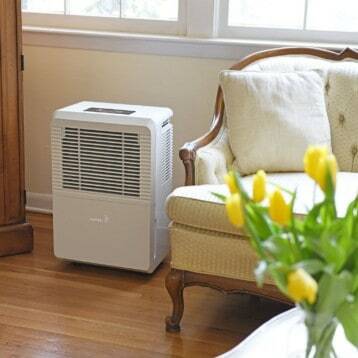 Dehumidifiers have several different features that may or may not be needed for your home. They also have a variety of capacity options. You can even choose how you dispose of the water a dehumidifier collects. The chart below offers you the opportunity to compare and contrast today’s top-rated dehumidifiers from real people who use them on a daily basis. Should I Be Purchasing a Dehumidifier For My Home? All homes make their own unique noises throughout the day. Sometimes this comes from the natural settling process. Some sounds might come from your HVAC or plumbing systems. Then there are the sounds that are in your home because your humidity levels are higher than they need to be. Here are just a few of the high humidity symptoms your home might be experiencing right now. Condensation build-up around your windows and doors. Floors or stairs that creak when you walk on them. An odor that is reminiscent of a wet dog getting a bath for the first time in awhile. Sometimes your house might not be showing you these symptoms because they are hidden behind walls or frames. High humidity levels can also affect your personal health as well. If you are experiencing these physical symptoms, then you may also benefit from the installation of dehumidifier. Allergy symptoms that are prolonged in nature or more severe than normal. Frequent issues with your sinuses, including the reoccurring development of sinus infections. Difficulty sleeping at night, especially during the warmer months of the year. When humidity levels are too high, these symptoms will continue to get progressively worse until the indoor environment is brought under control. You might find damage to your furniture begins to develop. Difficult physical symptoms may worsen and require more frequent visits to the doctor for treatment. If you or your home are experiencing any of these symptoms, then it may be time to invest into one of the industry’s best dehumidifiers today. If not, then listen to what your home is telling you so that you can respond with a dehumidifier in the future if the need arises. The human body is remarkably sensitive to humidity levels. In order for our skin to cool off when the body is overheated, it requires the air around it to encourage sweat evaporation. This is why high humidity levels feel so sticky. Your skin is literally preventing you from cooling down, which means you begin to overheat. The structures within a home are just as sensitive to humidity. Your drywall can only contain so much water. When it is exposed to high humidity levels that are consistent, the drywall will begin to “sweat” much like your skin. This produces a yellowish colored moisture droplet that will leave stains on your paint and floor. Since most homes are built with wooden studs and joists, the moisture will eventually creep into those components as well. The best dehumidifiers will help you to control these humidity levels so that you can feel comfortable inside while protecting the integrity of your home. Reducing humidity levels is done through one of two dehumidification options. Desiccant dehumidifiers. This type of dehumidifier contains a substance that will naturally dry the air when it comes into contact with it. These typically work the best when there are low temperatures and only moderately high levels of humidity that need to be controlled. Mechanical dehumidifiers. This type of dehumidifier draws your indoor air into the machine and artificially cools it by running it over refrigerated coils. Then it will heat the air back to room temperature once again. This process forces moisture out of the air, allowing it to be collected in a basin or bucket or drained away. When you need to remove moisture from an indoor environment, there are several factors which must be considered to make sure you’re purchasing the best dehumidifier for your home. Here are some of the common factors that are covered with more specificity in the individual dehumidifier reviews for each product. Capacity. Sometimes this may also be referred to as “size.” It refers to the amount of moisture that can be removed from an indoor environment over a 24 hour period. Many dehumidifiers measure this in pints, but the best small dehumidifiers may measure the amount in ounces. It’s usually a good idea to purchase the largest dehumidifier your budget can afford. Portability. Sometimes you’ll want to move a dehumidifier to a different room. Sometimes you just want a whole home solution instead. If you need to move the dehumidifier, look for high quality rolling casters as part of the unit’s design. Low Temperature Operation. Pretty much every dehumidifier will work well in hot weather. It’s when the weather turns cold and you need to sustain a 40% humidity level that you can begin to separate the best dehumidifiers from the rest. Look for models that offer automatic defrosting, defrost shut-offs, and other safety features that will help you protect your investment while saving you money at the same time. Where you intend to place your dehumidifier will also affect your shopping process today. Some dehumidifiers offer an air vent at the top of the unit. Others will have the air vent along the side of the machine. Top vents require wall placement, while side venting requires at least 6 inches of wall and furniture clearance to achieve proper circulation levels. What Dehumidifier Capacity Is Right for Me? For most homes, capacity is going to be the most important factor to be considered when shopping for the best dehumidifier. Because every home is a little different, you’ll have to determine how much humidity you have in your home. You’ll also need to consider the actual square footage of the room that needs a dehumidifier or the size of your house if you want a whole home solution. Although every space is different, there are some similarities that can help you select the right dehumidifier capacity for your home. First let’s make sure we’re on the same page when it comes to the descriptions used for the conditions in your room or your home. Wet. This means you have mold growth on your walls, floors, or furniture. There is a musty smell present and possible water seepage from your walls. This is typically 85-100% humidity. Extremely Damp. You’ll still see water damage on your walls, but there may not be seepage present. There will be an odor present and mold or mildew may begin forming. This is typically 70-85% humidity. Moderately Damp. There is typically an odor present, but may go away when you open up a window. Condensation is forming on your windows. It may feel warmer inside than it does outside if your HVAC system is turned off. This is typically 60-70% humidity. Lightly Damp. Symptoms of high humidity may be difficult to spot. Condensation may come and go, as will musty odors. You may see an increased level of pest activity. This is typically humidity levels that are 50% or above. One of the easiest ways to determine where your room or home fits into these definitions is to purchase one of the best humidity monitors for your home. Place the device in the room and see what your humidity levels happen to be. Based on the percentages that are registered, you can then begin to shop for the right dehumidifier capacity. What is the right capacity? Here is how we break things down based on the manufacturer’s recommendations from today’s best dehumidifiers. At 300 square feet or less. A 30 pint dehumidifier is suitable for lightly-to-moderately damp environments. A 40-45 pint dehumidifier may be necessary for extremely damp or wet conditions. At 300-500 square feet. A 45 pint dehumidifier will be suitable for most lightly damp or moderately damp spaces. Extremely damp rooms or homes will need a 50 pint dehumidifier. Wet environments need a 60 pint dehumidifier. At 500-700 square feet. In lightly damp environments, a 50 pint dehumidifier will often work. Moderately damp environments may need a 50-60 pint dehumidifier. Extremely damp rooms or homes should have a 60 pint model, while 70 pint models will be necessary for wet environments. At 700-1,000 square feet. You’ll want to have a 60 pint dehumidifier for lightly-to-moderately damp spaces. A 70 pint dehumidifier will be necessary for extremely damp or wet spaces. Once you get above 1,000 square feet, most homes are going to need a 70 pint dehumidifier in order to properly control humidity levels. If your humidity levels are above 70% and you have more than 1,000 square feet that you’re improving, then you’ll need to invest into one of the best 95 pint dehumidifiers on the market today. If humidity levels are at 85% or higher and you need to dehumidify 1,500 square feet or more, then you may need to look at commercial or industrial grade dehumidifiers. These models may need permits for their installation, so check with your local building and inspection offices to determine your requirements and if any specific building codes may need to be followed. There are some other lifestyle factors that may also influence what dehumidifier capacity will be appropriate for your home. If you live in a climate that is primarily humid, then you’ll want to add another 10 pints of capacity to the recommendations listed above. Rooms that have laundry equipment need an additional 5 pints, as will rooms that have multiple windows or entry points. If your household has 3 or more people, then another 5 pints will also help to control humidity levels more effectively. What Are the Prices of the Best Dehumidifiers? Dehumidifiers have a wide range of pricing based on their capacity, portability, and other features that may be included. Some entry-level small dehumidifiers are priced below $20, but only offer a few ounces of moisture extraction throughout the day. Other models offer you 95 pints of capacity, but come with a price tag that can often exceed $500. 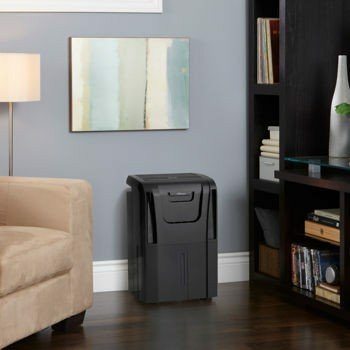 Most households are going to benefit from a dehumidifier that is priced at $200 or less. At this pricing level, you can typically find a dehumidifier that will effectively control humidity levels for a home as large as 1,500 square feet. This dehumidifier starts getting the job done from moment #1. Once you plug it in, you don’t have to turn it off. Continuous operation can happen as long as you have access to a drain. Don’t worry – even if you don’t have that access, the full tank alert system will let you know when to dump the water. It will also automatically shut itself off so you don’t get stuck with a big mess. Just make sure you don’t use an extension cord with this unit because you can burn it out if you do. Definitely an investment you’ll want to consider today. This is a small, portable dehumidifier that is extremely quiet thanks to the fact that it doesn’t have a compressor. The reservoir is easy to maintain and it’s size allows you to place this unit almost anywhere. It’s perfect for the bathroom, but it would also work well in other limited environments, like an RV. It automatically turns off when the tank is full, consumes very little power while operating, and holds up to 16 ounces of water so you don’t have to be constantly dumping the water. Need some help at the office? This dehumidifier will get the job done. We loved how compact this 50 point dehumidifier is. Not only is it Energy Star qualified, but it offers you three speed settings for maximum comfort. The turbo setting does a remarkable job of getting the moisture out of your air. We also loved how efficiently the dust filter operated. There’s even a “clean filter” alert that this unit offers to let you know that it’s time to give this dehumidifier a little TLC. A continuous draining option is possible with this unit, but it is not included with purchase, so keep that in mind as you’re shopping. There are so many 30 pint dehumidifier on the market today that it can cause your mind to spin. Many of them do a decent enough job, but this model stands out from the rest of the pack for several reasons. There’s the high quality casters which let you take this dehumidifier from room to room if necessary. The water tank holds 7.6 pints and includes a splash guard, so after your initial run, you’ll have limited maintenance. It operates at low temperatures to help save you even more cash and the electronic controls are convenient and easy to use. There’s a lot of good stuff happening with this affordable dehumidifier. It’s definitely worth taking a look. If you’re not ready to step up to a 70 pint dehumidifier, but a 30 pint model is too small, then we suggest this compromise for you today. Not only will it protect your home from high moisture issues, but it’s design helps to eliminate bacteria in your air as well. The dehumidification controls are conveniently placed at the top of the machine and it’s portable enough that you can still push it from room to room. It also has all of the alerts you’d expect so you know when it’s time to do some maintenance work. The price is nice, so combine that with these features and you’ve easily got one of the best dehumidifiers on the market today. If you have cooler temperatures, but high humidity levels, then we strongly recommend this dehumidifier today. It operates at temps that are as low as 41F and offers you a continuous drain option so you can run it all day if necessary. The digital humidistat lets you know current facts about your indoor environment, including room temperature, so you can make whatever adjustments may be necessary. The casters on this unit are a little cumbersome on carpet, but otherwise we think you’ll love the experience this dehumidifier can provide. This portable dehumidifier gives you 30 pints of service for every 24 hours. It’s recommended for a max room size of 1,500 square feet, but we found it works a bit better when you can knock the space requirements down by 33%. The water bucket is 3.5 liters in size and you have up to 80% relative humidity controls to set, so you can be as comfortable as you want. Two fan speeds operate quietly, there is a direct drain option, and it is Energy Star rated. This is one of the most convenient dehumidifiers we had the privilege to look at. The built-in drain pump helps you be able to pump water vertically into almost any drain you may have in your home, giving you a maximum level of flexibility. It lets you know what your current humidity levels and room temperature happens to be and offers continuous drain operation. The bucket that carries your condensate even has a convenient carrying handle. A 24 hour timer is also included as a standard feature. It’s definitely a solid buy today. This dehumidifier also offers a built-in pump for maximum convenience, but you also get 3 different service modes. You can manually turn this unit on, set it for continuous running, or having it on auto dry so you can set it and forget it. The air filter is washable, which is another nice touch, and the caster wheels do a reasonably good job of letting you take this dehumidifier from room to room. We liked it because it can operate in fairly large spaces, but won’t hurt your budget too much to do it. Give it a second look and we think you’ll see why it is one of the best dehumidifiers today. The built-in pump on this 50 pint dehumidifier is its key feature. This manufacturer patents the pumping function and you can see why once you use this dehumidifier. It gives you a very efficient moisture removal system that will let you quickly adjust humidity levels in any room or even an entire small home. Visible water level checking is available with this model’s design and you have a 24 hour timer you can set. An anti-frost device is also included. We highly recommend this model to you today. The best dehumidifier reviews will help you find the key features you need for the indoor environment you want. Consider all of the pros and cons of each model, compare and contrast your favorites, and you’ll be able to make a purchase today that will give you years of ongoing benefits.